Jerome was focused entirely on his camera. From his run up the hill I could see he was unaware of me as I walked our dog, Luna, at dusk in Pancho Villa State Park. When I greeted him with a wave and a “Hey, hello!” his intent framing of a picture prevented his hearing. Before I could call his attention to the fact that I had visited his classroom just that morning, he was bounding down the hill to his mother’s car. Twilight came, and I saw them driving place to place where he’d jump to the pavement framing more shots. It was a joy to see the power of learning made real. Jerome was one of eleven 6th graders from Columbus Elementary, in remote southern New Mexico, to take part in Project Zero’s pilot study for learning last spring using the Out of Eden Walk. In the classroom where I assisted their teacher, Mrs. Kim Perea, we had just reviewed Prompt 3 in which the young students were assigned the task to walk through their own neighborhoods. They were asked to observe closely, move slowly, and to post photographs of something they wanted to share with other students on a global platform. The exercise, like each of the prompts created by Project Zero, was intended to emulate the walk journalist Paul Salopek has undertaken to move slowly through the world in the footsteps of our ancestors. Jerome would be sharing his pictures with students as far away as Mumbai and Sydney and it was clear to me from that evening encounter that he was immersed in the experience. How do we make learning real when the context for young learners is increasingly digital? Where are the opportunities to shift learning from the conceptual to the experiential? These are challenges not only in education but ones that Paul himself faces daily in trying to bring a physically tangible journey to a distracted audience in an age of pixels. These challenges are what make Project Zero’s Out of Eden learning program so meaningful. 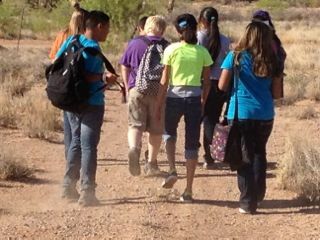 Our 6th graders took quickly to the Walk with their easy literacy on the Internet. Yet to them, Paul’s journey was, at first, only an admirable fantasy, not one in which they could situate themselves. This perception changed through simply slowing them down, allowing them to rediscover neighborhoods, interview others, document observations, and compare notes with friends worlds away. They soon discovered that any of us can have a thoughtful global – or local – experience if we but place ourselves fully in our environment. So it was in this spirit that our little group seized upon the idea to create a walk of our own. Our walk would leave the ‘Internet” and get us “Out.” We wanted to experience the Out of Eden Walk in footsteps. We planned a route from the edge of our town to the US/Mexico border, just a short distance from our school. (A border not unlike many Paul will cross). We chose a date, and imagined what official preparation was required: parental permission, administrative permission, securing a bus ride back to school. We talked about what to bring beyond essentials, like water, and decided our cameras, plus something to write with in case of an interview, were important. The actual simplicity of the Out of Eden Walk defies the contemporary hurdles of crossing borders, applying for visas, and spontaneous diplomacy. To our surprise, our own walk would mimic Paul’s journey even in statesmanship. From negotiating twists and turns with the school principal to the students airing convincing arguments at home for permission to walk, our journey was brought closer to Paul’s than we ever expected. When approval on all fronts was granted we experienced the genuine thrill of having brokered our outing successfully. On the hot June morning of our walk, one student, Camren, had set out with a plan for an interview. Dust kicked up around our boots as we passed through desert scrub and slowly approached our goal, the border fence. A lineman up an electric pole was hard at work in the wearying heat not a stone’s throw away. Faced suddenly with an opportunity to ask a few questions, Camren shyly turned away. At the end of our walk I asked why he’d declined to interview the lineman. He answered that when the moment came he was too embarrassed. No matter, I thought. I knew that actually taking the walk, facing opportunity and then even discovering hesitation, was a moment of learning made real for Camren.